Sometime between February and March, when you get the feeling like maybe nothing could ever be green again, I discovered River Cottage. It’s a television series by chef Hugh Fearnley-Whittingstall, centered around his home in Dorset (England), where he grows or forages much of what he prepares. One episode that particularly struck me focused on gooseberries. He spoke so highly of these berries that I just had to have them on my list of things to try. In case you didn’t know, I am a co-writer on a blog called Driftless Appetite. 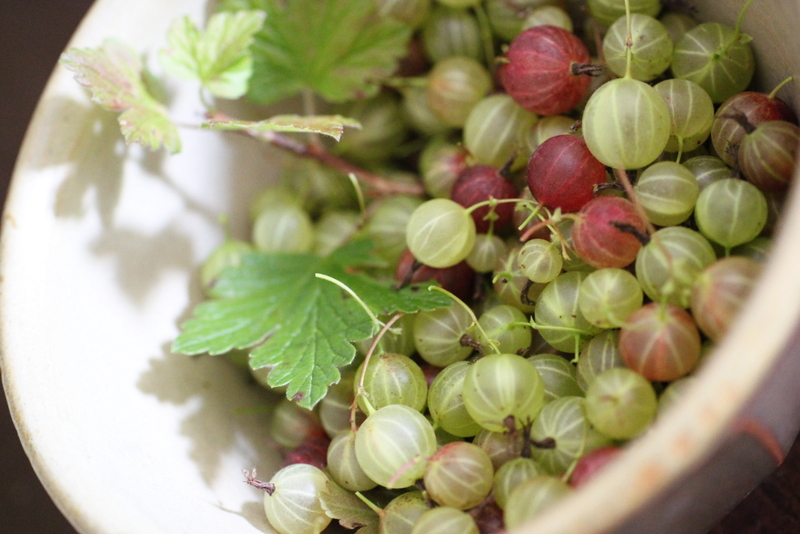 A couple of weeks ago, I decided to ask our followers on Facebook and Twitter where I might find some gooseberries around the area. That same day, I received a message from Lisa Hay, telling me that she had a couple of bushes at her house. Lisa and her husband Don own the Cothren House. Their historic log cabin and stone cottage are available for lodging year-round. The Hays are also writers for High Street Beat. 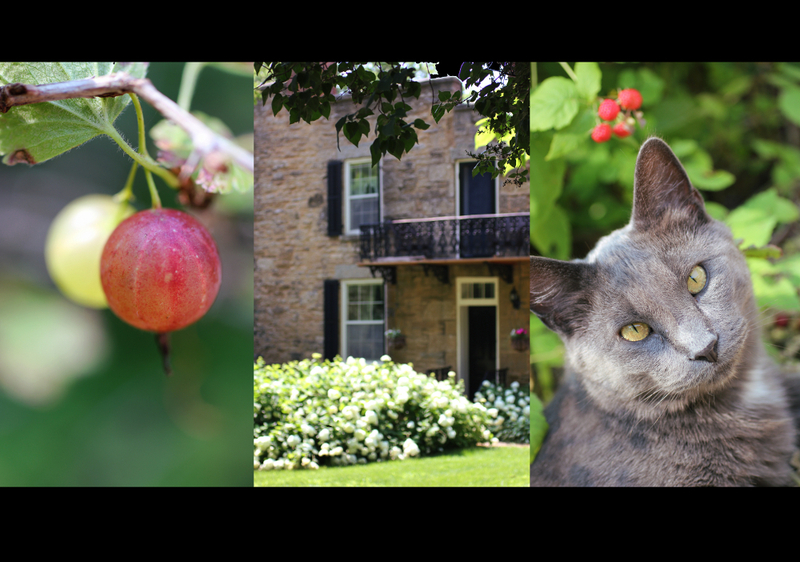 The photos below include: ripened and un-ripened gooseberries, a little peek of the Cothren House, and the snuggly cat named Night Sky. Hiding somewhere was his buddy, Gordon Whitefoot. The gooseberry bushes were originally planted by Dennis Ramberg (who owned the house from 1976-1994) so he could make gooseberry fool. A fool is a classic English dessert made with pureed stewed fruit that is folded into a generous amount of sweet custard. From 2001-2007, the property was owned by Carol and Eric Kyser. Carol liked to make a cocktail from the berries which she called “Cothren Comets”. The Hays like to wait for the berries to get ripe and eat them right off the bush. Thanks to all of the above, especially to Lisa, I was able to concoct my own gooseberry treat. 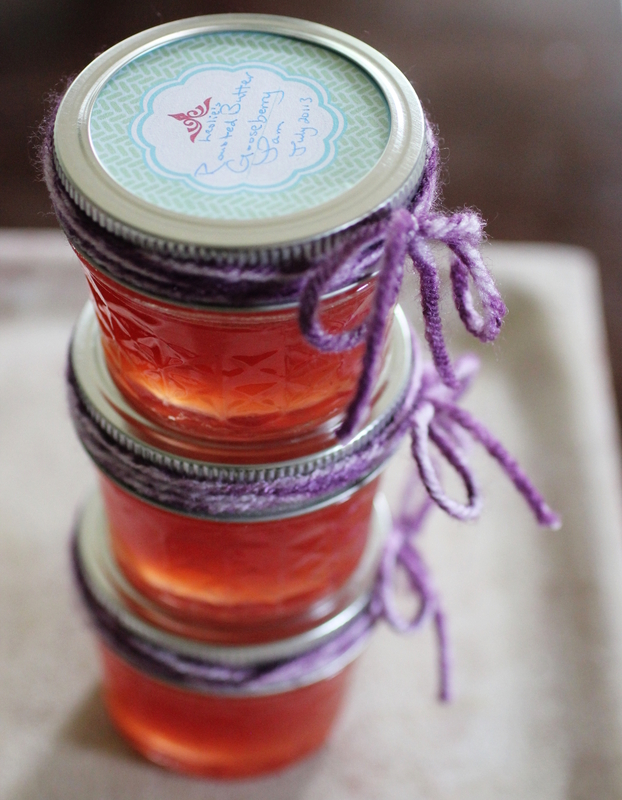 Here it is, three little jars of my Roasted Butter Gooseberry jam. These berries are quite sour so I thought that the creaminess of the butter might enhance it. Even better, I decided to brown some butter before adding it to the jam to give it a bit of a nutty flavor. I would say that the gooseberry tastes like a combination of grape and fig. Have you had this fruit? Do you know of any other lesser known berries I should try? This entry was posted in Architecture, Food, Lodging, People and tagged Cothren House, gooseberries, jam, Leslie Damaso. Bookmark the permalink. Pretty cute pictures and nice article! My Mom used a combination of the really ripe and the green gooseberries to make a really tart pie. Served still slightly warm with ice cream is great. Picking them on my Grandparents farm was a fun-filled family day. Thanks for bringing back some very fond memories. Gooseberries were all over the woods of my grandparents farm. Have you tried chokeberries? We get them from the Dane Co. farmers market. The are tiny and are high in tannins. We make simple syrup with them for cocktails, a few are featured on my husband’s blog.